FOX Sports Midwest will televise eight SIUE men's basketball games in 2017-18. This marks the sixth consecutive year that FOX Sports Midwest, which features St. Louis Cardinals baseball and St. Louis Blues hockey, will serve as the television home of the Cougars. FOX Sports Midwest reaches nearly 6 million homes. This season, for the first time, FOX Sports South and FOX Sports Southeast also will televise several of the games in the package, bringing SIUE basketball to as many as 12 million additional homes. "We are very proud and grateful for our relationship with FOX Sports Midwest," said SIUE Director of Athletics Dr. Brad Hewitt. "With the additional coverage on FOX Sports South and FOX Sports Southeast, we are not only extending the recognition of our University, but showcasing the entire Ohio Valley Conference." FOX Sports Midwest coverage begins Friday, Nov. 15 when the Cougars welcome Valparaiso to the Vadalabene Center for a 7 p.m. contest. 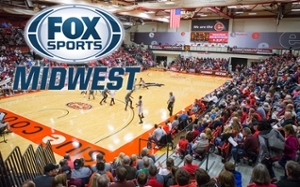 The rest of the FOX Sports Midwest schedule at the Vadalabene Center features South Alabama (Dec. 10), Chicago State (Dec. 19), Belmont (Jan. 11), UT Martin (Jan. 20), Jacksonville State (Feb. 3), Murray State (Feb. 10) and Austin Peay (Feb. 22). The full schedule, including game times is below.